A first for manned space travel. In Japan she is being called the Mum Astronaut. Naoko Yamazaki is the second Japanese woman in space but it's her family life that is getting attention back home. The space engineer's husband gave up his job with a software company to look after their seven-year old daughter Yuki, allowing his wife to pursue her ambitions. Japanese television has been showing Taichi Yamazaki washing rice and doing the laundry, unfamiliar tasks for Japanese men. Wilson is an aerospace engineer from Boston, Mass. 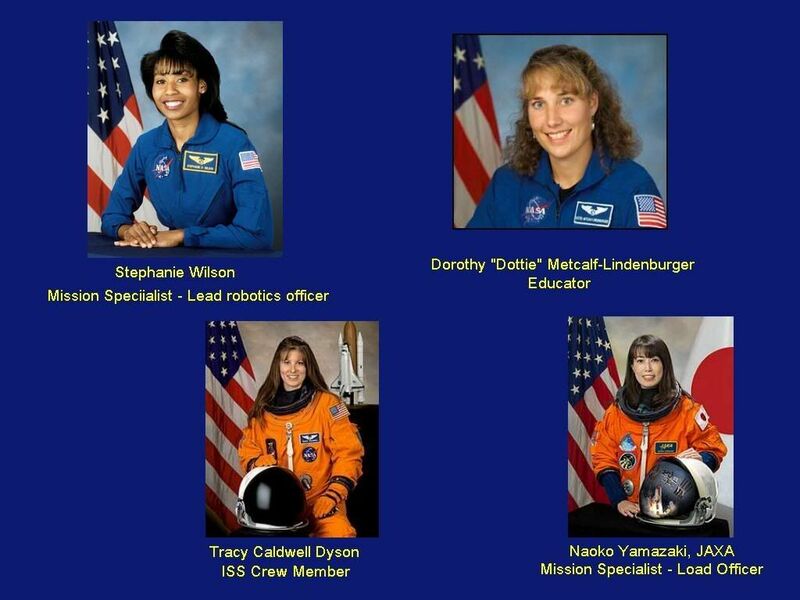 She became the second African-American woman to fly in space during her first spaceflight in 2006. Discovery's current flight is her third trip to space. Metcalf-Lindenburger, 34, is making her first career spaceflight on Discovery, but the drive to reach space has been with her since high school, when she attended Space Camp in Huntsville, Ala., while in ninth grade. She plans to film some educational videos about the role of robotics in space. Caldwell Dyson has had a different road to space than her three shuttle comrades. She launched to the space station Friday on a Russian-built Soyuz spacecraft alongside two Russian cosmonauts. A former chemist and electrician, Caldwell Dyson is on her second spaceflight, though this one is a six-month trek as a flight engineer on the station's Expedition 23 crew. 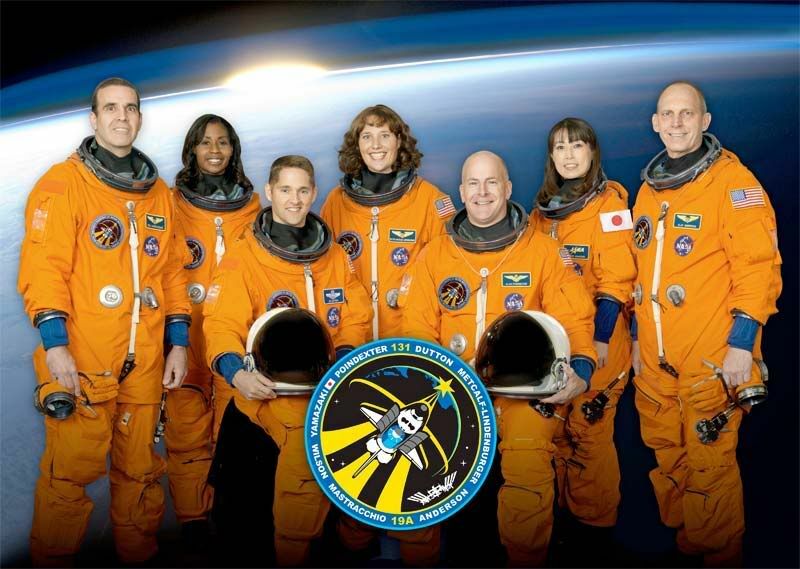 The three female astronauts aboard Discovery will spend about 13 days in space before the shuttle is due to return to Earth on April 18. Three spacewalks are planned during the flight, which is one of NASA's last few remaining shuttle missions before the space agency retires its three-orbiter fleet later this year. Orbital Mechanics seem to put all the flyovers during the early mornings - from 3am to 5am. The best view will be on April 12th, with a bright magnitude of -2.9 and elevation of 49 Degrees high in the North North West, (five closed fists up from the horizon), at 4:46 am. But the day before, we will get TWO flyovers little more than an hour apart. Get up early and catch 13 souls flying over Chicago skies. I think leaving the toilet seat up in orbit causes all kinds of messy problems! I've noticed that when the shuttle launches in the early morning for an ISS mission, the flyovers for us tend to also be in the early morning. When it's an afternoon launch, we get an early evening flyover. But I've only been paying attention to the mission flyovers for a few months. With more daylight hours, we may not have any visible flyovers if the next launch is in the afternoon. I hope somebody smart will prove me wrong though. ... broad daylight sightings are common. The early morning flyovers should be good during this mission. The duo of the Shuttle & ISS will make a bright flyover early this morning at 5:09 am, mid high in the SE. It will be visible for almost four minutes. and -2.7 in magnitude at at height of 48 degrees. 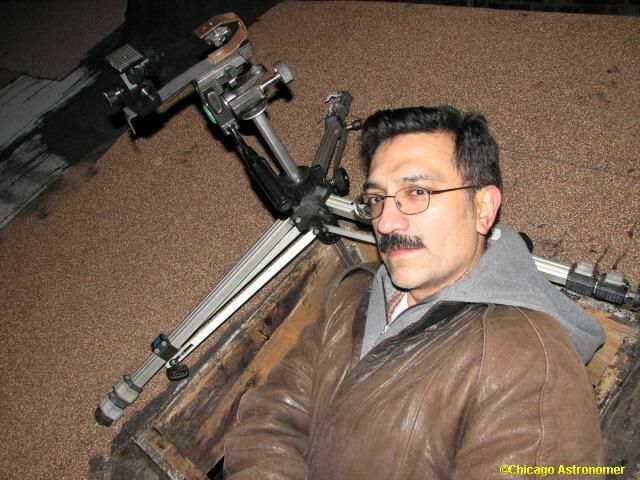 Taken in March, one can clearly see the Russian Soyuz space craft docked. I will attempt to image the Shuttle/ISS duo this morning myself. The skies were crystal clear. The kind that are deep and transparent...rare. Scheduled for this morning was a pass at 5:08 to 5:12 am from the SSW and reaching up to a respectable 48 degree in elevation. A perfect opportunity to catch it. Setting up my tripod, I am fortunate that it has the ability to squat quite low...and was able to spread the legs soilidly on the angled roof. I stayed "in", sticking my way through the access door. The video just doesn't do this sight justice and it's just....ok. It was indeed pretty bright, (-2.7) and made it's gracious arc to the Northeast - steadily, until it disappeared behind a building to my east. 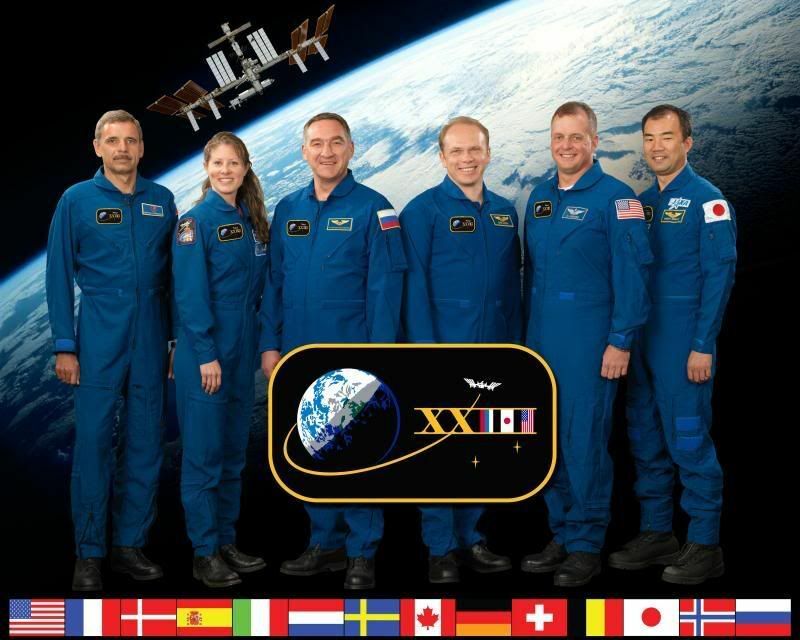 Incredible that 13 souls were now in orbit - represented by that bright star-like object. 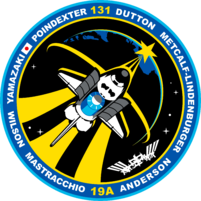 And at the time of the pass, two astronauts were on a EVA - working to replace a external tank. Near the end of the video, I bid a "Hi Guys" under my breath...and sounds odd on camera. There will be more early morning passes, and on the 10th two...but the next time, I think I will do time exposure shots. They look better and the trails spectacular. Preparation is never a guarantee of success, and that was true for me this morning. 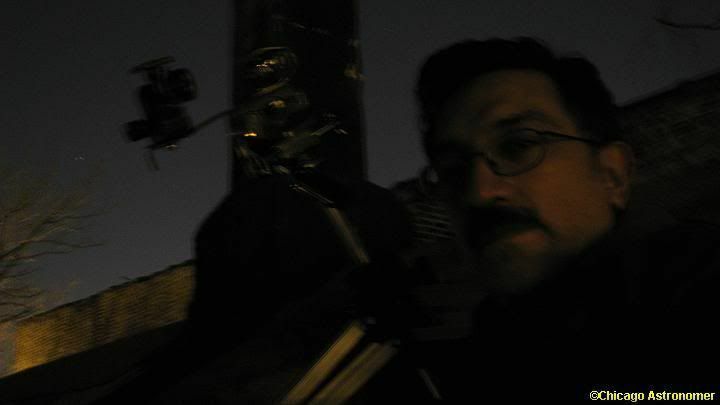 I was hoping to get some digital pics and maybe a video with my little Vivitar digital camera, and hopefully get a close-up video with my Meade Lunar & Planetary Imager hooked up to my 6" Orion Skyquest Dob. I have visually tracked ISS with the Dob a few times, including with my 10mm eyepiece, which has a rather small field of view (I'm not sure how many arcseconds; I should probably look it up). The LPI has an even smaller FOV, and I practiced this morning trying to keep a much slower moving target (Saturn) in view, and even that was a challenge. As ISS/Discovery came into view, I grabbed my camera and turned it on, but my eager, frozen index finger immediately turned it off. ISS/Discovery was quickly nearing it's zenith, so I gave up on the camera, and started video capture with the LPI. I tried to line up ISS/Discovery in the crosshairs of the Dob finder scope, but it moves so fast, and is very difficult to keep up with. I tried following the pair with the telescope for over a minute, and thought I was doing well, but when I looked at the captured video later, only once did I even catch a short glimpse, at the very edge of the screen. The path of ISS/Discovery was taking it out of view from where my telescope was set up, so I grabbed my camera and ran around the side of the house to follow it to the northeast. It was starting to dim, and my camera isn't sensitive in the dark, so I didn't even get a picture of it. Having failed in my objectives the capture the orbiting spacecrafts, I spent the last minute of the pass watching it fly into orbital (and soon after for me literal) sunrise. Somteimes it's wise to know when to quit, and just enjoy the moment, so I did. Glad of it, too. I didn't realize until later that there were spacewalkers during outdide until a few hours later. How cool, even if they didn't see me wave. 'Hi guys." That's funny. I always wave. Silly, I know, but sooner or later somebody is going to ask what the heck I'm waving at, and I might get a startled reaction when I tell them. Call me a pessimist (and it won't be the first time), but I may have seen Space Shuttle Discovery on orbit for the last time. Okay, technically I didn't see Discovery, but rather ISS while she was docked. I snuck (sneaked?) out of work at 4 this morning with a coworker who was curious to see Station. It was my last pass on this STS-131 mission that will be higher than the treeline, and even this one was rather low. There may have been some scattered clouds, because I was sure I was looking in the right place at the right time to see the pair coming out of Earth's shadow, but by the time I spotted them, they were already low in the northeastern sky. 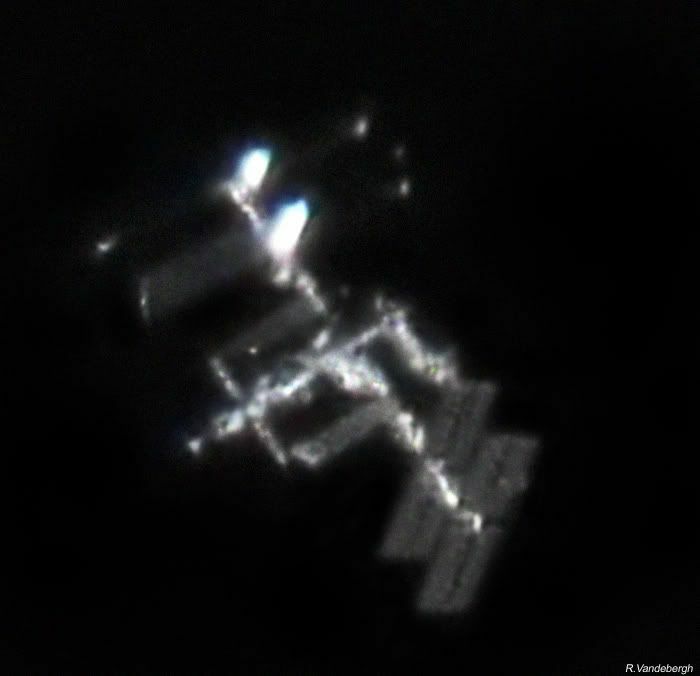 I pointed it out to my buddy Dillon, and he was able to find ISS/Discovery in my 10x50 binoculars, but he didn't report anything but a star-like point. 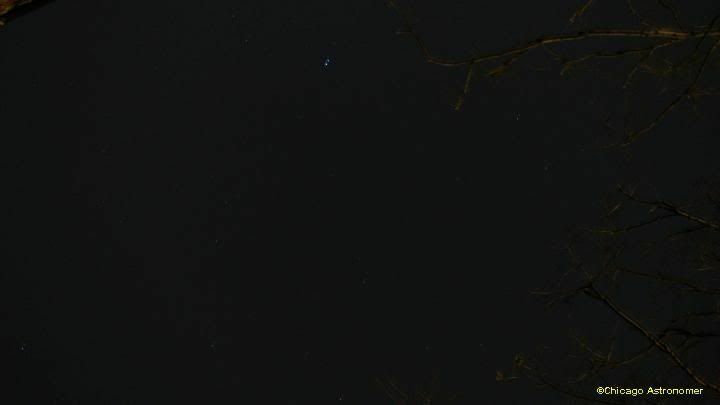 I haven't yet seen ISS in the binos, and I'm curious to know how it looks. Maybe sometime soon I will check it out. Hopefully I will have some good flyovers for the final three shuttle missions, but until I find out, I'm thinking this morning may have been my final sighting of Space Shuttle Discovery. I too have been following the ISS/Shuutle pass overs and with my 15 x70s...I can make out an irregular shape to the passing light. Knowing what I'm looking at, I can just barely make out the solar panels, but not the Shuttle. I think that they will extend the Shuttle program at least a year....I hope. 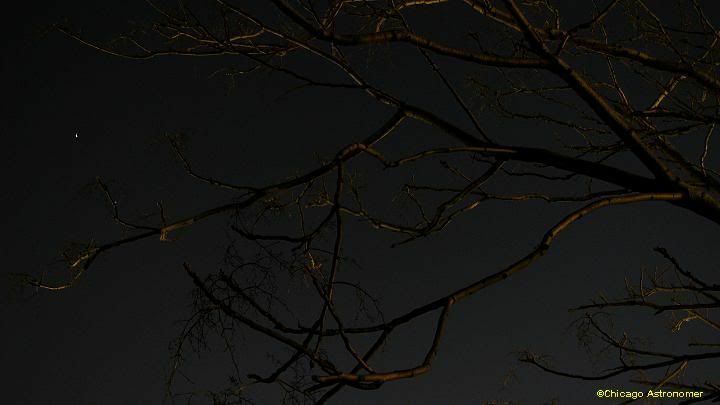 I was having an all night astronomy session Saturday night/Sunday morning, and although I knew there would be two early morning flyovers of International Space Station and Space Shuttle Discovery, they were low on the northern horizon, and I wasn¡¯t expecting to see either of them. The pair would first arrive at 4:00 AM, Discovery 44 seconds earlier, and have a maximum altitude of 13¢ª above the horizon. Since trees block my view that low to the north, I walked down to the end of the street, where the tree line is farther in the distance, possibly allowing me to see the orbiting spacecraft. I had the alarm on my phone set for 4:00, and was expecting Discovery to arrive 22 seconds after it went off. I wasn¡¯t counting down the seconds, but when I saw something fly into view exactly where I was expecting, I assumed it was Discovery. Heavens-above.com gave Discovery a magnitude 1.5, and should have been visible. As it drifted across the sky, I was looking back to the northwest again, thinking ISS should arrive any second, at magnitude -.5. It didn¡¯t show up, and I realized that I had completely missed the space shuttle. I¡¯m not sure what orbit they are on currently, but I just checked the NASA site, and if the de-orbit burn is on orbit 237 for a Kennedy Space Center landing, it looks like they will come in right over southern Lake Michigan, and we might have a view of it. I¡¯ll have to look into this more, but I don¡¯t know if I will have the time. 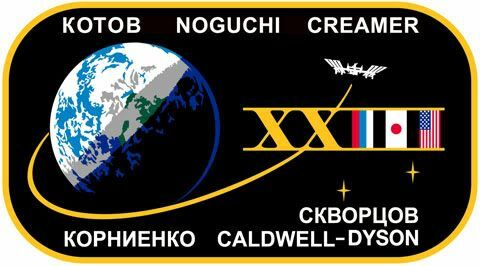 They are currently on orbit 226, so 237 will be tomorrow morning. Let's try to have somebody observe this. I will be looking. Well, Discovery is on runway 33 at KSC, and they didn't get the first landing attempt, but how cool would this have been? I've been hearing on the radio this morning that we might have been able to hear the twin sonic booms. With only three flights left, I doubt there will be an opportunity in our area to see the Shuttle on it's approach to Kennedy Space Center.